The launch of the new Liverpool home kit has prompted an angry response from a number of the families of those killed in the Hillsborough disaster. 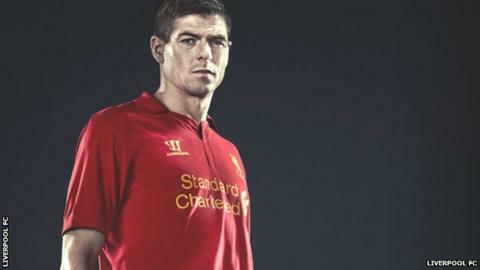 The club's home shirt for the 2012-13 season, designed by American company Warrior, was revealed on Friday. Fans have welcomed the design, but the decision not to consult some families over the decision to move the symbol honouring the dead, has angered many. The Hillsborough Justice Campaign (HJC) said the actions were "insensitive". The new shirt sees the club's logo, which featured an image of the Shankly Gates, replaced by the original Liver Bird crest that became synonymous with Liverpool's success in the 1970s and 80s. As a result the two Justice flames honouring the Hillsborough campaign have been moved to the back of the shirt. The decision to move the flames is not the source of frustration but the decision to only consult one Hillsborough group has sparked anger. Liverpool did take time to meet with the seven members of the Hillsborough Family Support Group (HFSG) committee but other groups were not consulted. A HJC statement read: "We have noted that the Hillsborough flames and '96' will now appear on the back of the shirt 'after consultation with family members'. "We can confirm that no bereaved families of the HJC were contacted or consulted. The first we were aware of this was via the minutes of the Supporters' Committee March meeting. Once again LFC has chosen to ignore the HJC and their families. "The continued refusal of the club to acknowledge the HJC is insensitive, divisive and deplorable - 96 is more than a number. LFC would do well to remember that." Liverpool moved swiftly to defend their part in the process and claimed they had made every effort to deal with the issue as sensitively as possible. A spokesman said: "The club consulted with the HFSG committee and shared a number of alternative designs which were considered. "The committee selected a design, which includes the number 96 to recognise those who lost their lives. Nobody has more respect for the 96 and their families than this football club." In America, Warrior makes equipment and clothing in ice hockey and lacrosse. In 2004 the company was bought by New Balance, which retained the founder, Dave Morrow, as president and chief executive officer. Morrow, a lacrosse player, founded Warrior in his Princeton dormitory where he developed the first titanium stick, which the university used en route to their National Championship that year. Warrior was taken from Morrow's High School American football team in his home town of Michigan, the Brother Rice Warriors. Margaret Aspinall, chair of HFSG, lost her son James, 18 at the disaster. She said: "It is difficult for everyone to be consulted all the time. I know there are a number of the bereaved families in the HJC and I can understand what they are saying." Andy Heaton, editor of Liverpool fanzine The Anfield Wrap, added: "Is it really that hard to consult all of the families, not some?" The row threatens to taint the launch of the kit, which represents the start of the biggest deal of its kind in English football history. The £25m-a-year contract with Boston-based Warrior Sports more than doubles the Anfield club's previous agreement with adidas. Warrior is a brand better known in the lacrosse world. According to PR Marketing, a German market research company, Liverpool are the fourth-biggest replica kit seller in football, behind Manchester United, Real Madrid and Barcelona. About 900,000 shirts are sold annually.